Joseph Kay, the man claiming management rights to the assets of late Georgian billionaire Badri Patarkatsishvili, has announced how he intends to divide the fortune up. In an interview with Russian newspaper Gazeta Kay said 25 percent of the billionaire’s fortune would go to his widow Ina Gudavadze, ten percent to each of his two daughters and five percent each to his two sisters and mother. Kay said that another quarter of the fortune would go to a woman he identified only as “Olga,” whom he said may have also been married to Patarkatsishvili, and ten percent to an illegitimate son, David. Kay said a final five percent of the fortune had been designated for the billionaire’s “brother,” an apparent reference to himself. 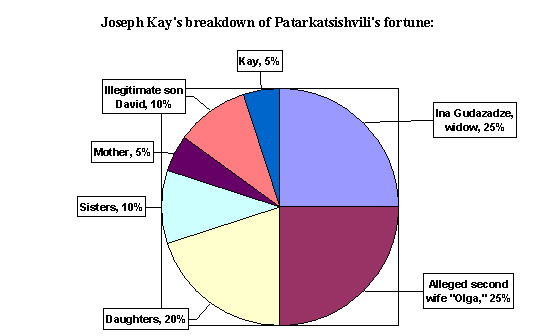 Patarkatsishvili’s exact fortune is unknown but Kay said it is “much more than USD 1 billion.” Previous estimates have put it as high as USD 14 billion. Last month Patarkatsishvili’s widow released a statement claiming to have won a case in the United States against Kay. She said Kay had admitted in court he had no legal right to manage the late businessman’s assets. He denied the report in the Gazeta interview. “This was not a court case, but only an informal agreement between lawyers. There hasn’t been [a court hearing], and the date for the hearing hasn’t been set. I agreed that before the case, I will refrain from managing Patarkatsishvili’s fortune,” Kay said. Ina Gudavadze argues she is the legitimate heir of her husband’s assets. Patarkatsishvili’s holdings in Georgia included Standard Bank and the once-formidable Imedi media group. Patarkatsishvili was found dead at his English mansion in February. Doctors suggest he died of a heart attack, and extensive toxicology tests found no sign of foul play.